But the American Age may not be ending. 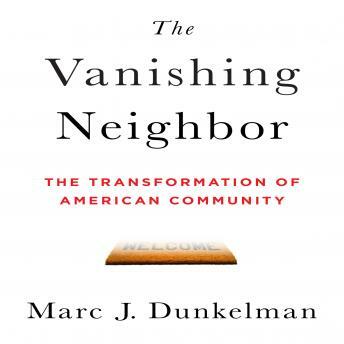 In The Vanishing Neighbor, Marc J. Dunkelman identifies an epochal shift in the structure of American life-a shift unnoticed by many. Routines that once put doctors and lawyers in touch with grocers and plumbers-interactions that encouraged debate and cultivated compromise-have changed dramatically since the postwar era. Both technology and the new routines of everyday life connect tight-knit circles and expand the breadth of our social landscapes, but they've sapped the commonplace, incidental interactions that for centuries have built local communities and fostered healthy debate. The disappearance of these once-central relationships-between people who are familiar but not close, or friendly but not intimate-lies at the root of America's economic woes and political gridlock. The institutions that were erected to support what Tocqueville called the "township"-that unique locus of the power of citizens-are failing because they haven't yet been molded to the realities of the new American community. It's time we moved beyond the debate over whether the changes being made to American life are good or bad and focus instead on understanding the tradeoffs. Our cities are less racially segregated than in decades past, but we've become less cognizant of what's happening in the lives of people from different economic backgrounds, education levels, or age groups. Familiar divisions have been replaced by cross-cutting networks-with profound effects for the way we resolve conflicts, spur innovation, and care for those in need. The good news is that the very transformation at the heart of our current anxiety holds the promise of more hope and prosperity than would have been possible under the old order. The Vanishing Neighbor argues persuasively that to win the future we need to adapt yesterday's institutions to the realities of the twenty-first-century American community.